Today’s science tasks included an inspection on an advanced microscope and readying a magnetic field experiment. The crew also worked on a failed electrical device that was robotically transferred to the Kibo laboratory module in early August.Commander Randy Bresnik and Flight Engineer Paolo Nespoli removed a failed Main Bus Switching Unit (MBSU) from Kibo’s airlock today. The duo swapped out some electronics gear in the MBSU and tested the device while it was connected to a laptop computer. Nespoli started his day setting up the Magvector magnetic field experiment for operations set to begin next week. The study investigates how Earth’s magnetic field interacts with an electrical conductor potentially improving electrical experiments in space. As Bresnik was wrapping up his MBSU maintenance work, Nespoli began inspecting advanced microscope gear. The variety of new Light Microscopy Module gear had been recently launched and was being checked for shattered materials. 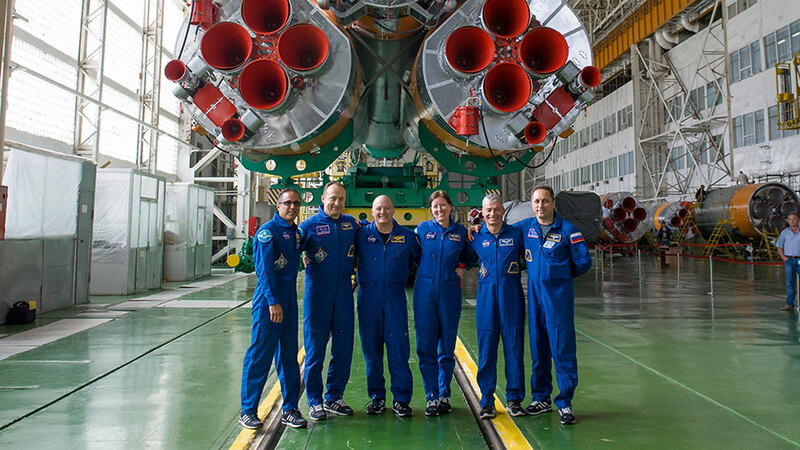 Three new Expedition 53 crew members are at the Baikonur Cosmodrome just five days away from their launch to the International Space Station. Two NASA astronauts and a Roscosmos cosmonaut are in final preparations checking their Sokol launch and entry suits and examining their Soyuz MS-06 spacecraft.